1. 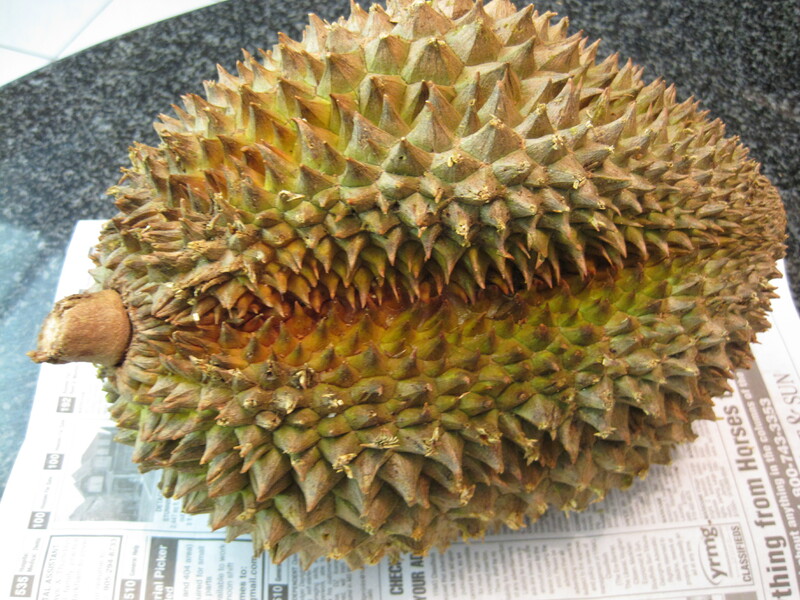 There are different types of durian and according to my mother, the “mornthong” durian are the best. Look for the three Chinese words in orange from the photo below left. 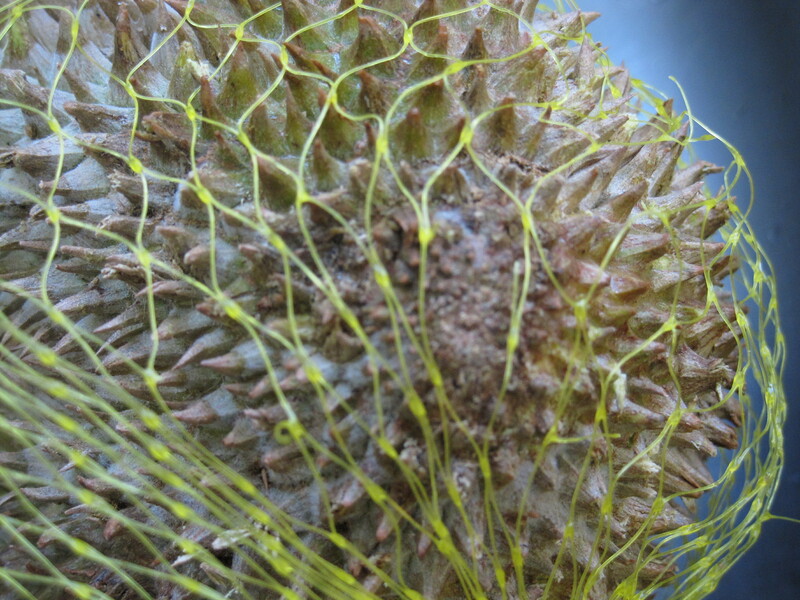 These durian are characterized by a cluster of small, short, and dull spikes on the bottom of the fruit (see photo below right). 2. You want one that’s large and heavy. 3. You want one that has a stem still attached. 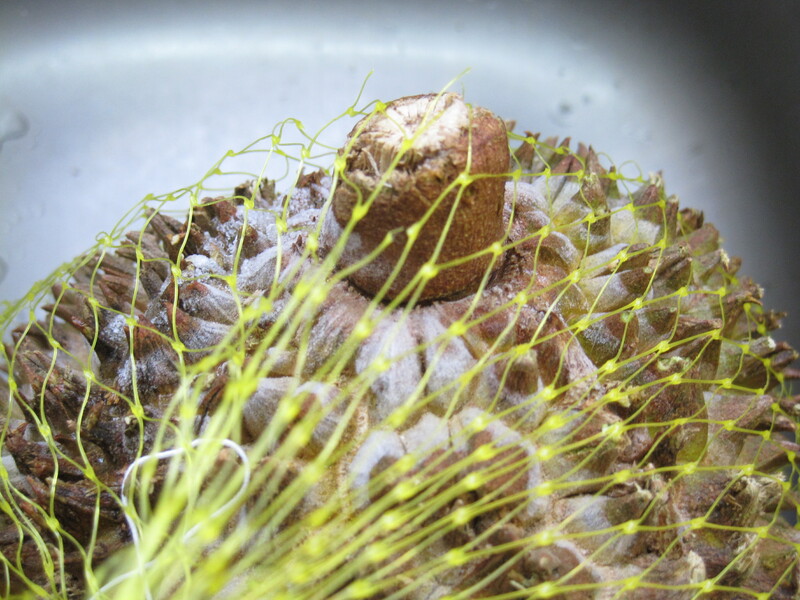 Also, make sure that the stem is not darkly coloured all the way through. See the photo below for an example of a good stem. 4. 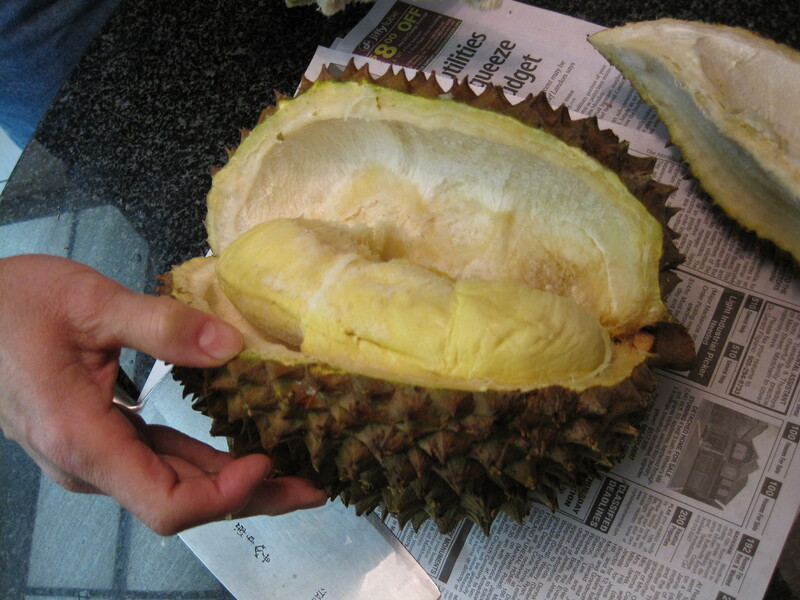 Even frozen and unopened, a good durian will be fragrant. 1. You will need a large, sharp, and heavy knife. We prefer to use a cleaver. 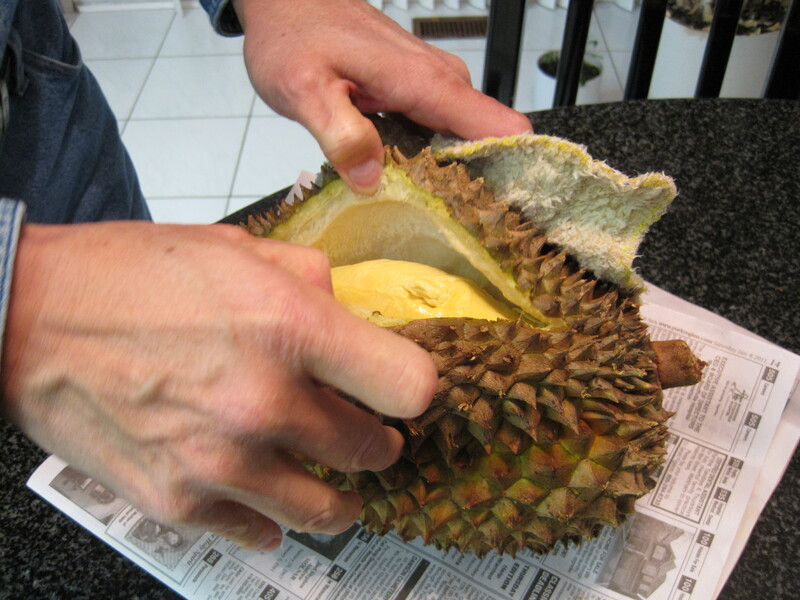 With a thick towel between one of your hands and the fruit, position the durian so that the midline of one of the lobes is facing upwards and running vertically. Then use many short, quick motions to dig (ie. 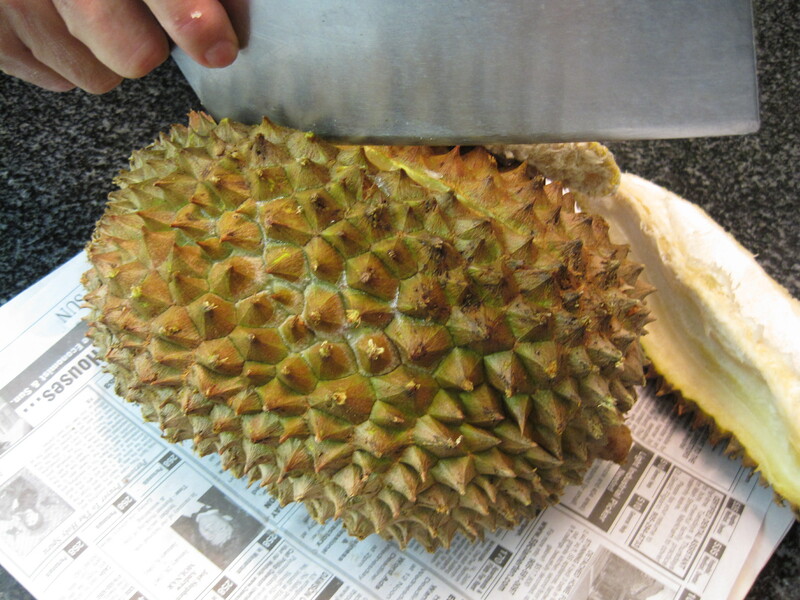 stab) the back heel of your knife along that midline all the way down the fruit (see photo below). 2. Then carefully open the lobe by peeling back both sides of the tough skin from your cut along the midline. Use thick towels to protect your hands. 3. Carefully scoop out the yellow flesh with a spoon and set aside. Nice post . Thank you for, writing on this blog page dude. I’ll message you again. I didn’t know that. Hi Ali, How did you “get over” the unique and terrible fragrance of these spiny beasts? Also, are these sold in Kingston anywhere? I’d love to try one sometime, if I can work up the nerve that is. I’ve read the flavor is wonderful! Hi again, Cathy! 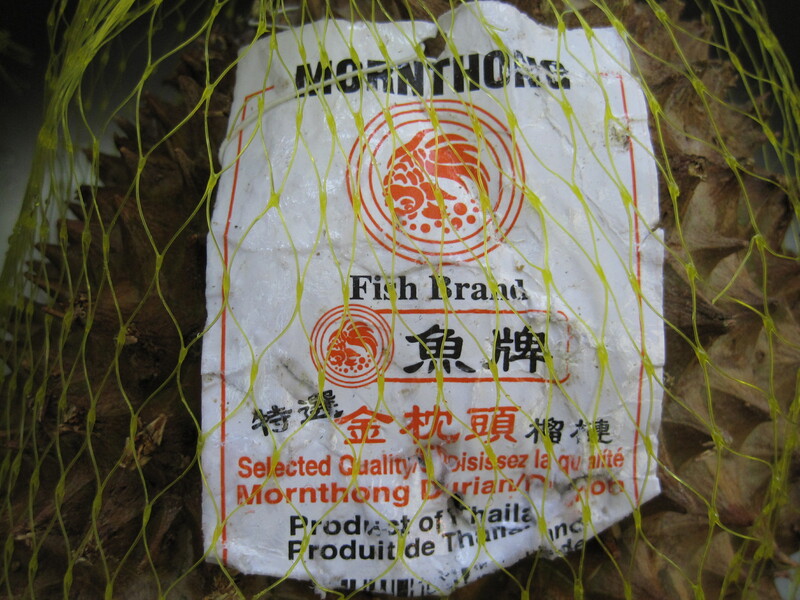 I found frozen durian (flesh only, even the seeds were removed) at the Asian grocery store by Princess and Division!